Rose Kuli topwater fishing lures are useful lures for catching bass, trout, walleye, northern pike, and muskie. They have lifelike 3D holographic eyes that seem to pop right out at you. They are lifelike and multi-jointed so they swim and act just like a baitfish would. The fish that you are out to catch can’t resist this lure. With a variety of colors to choose from the Rose Kuli is as close to real live bait as you can get. The front-bill helps it swim and dive naturally through the water. These topwater fishing lures come in choices of rainbow, mixgreen, sinklure, orange, scar, mixblue, red and blackred. I recommend getting all seven models because the bass can’t resist these lures. The Rose Kuli lure is the number one Bestseller on Amazon’s Best Sellers List for fish plugs now that has to tell you something. The multi-jointed body is connected with textile fabrics that make it very flexible, and the tail moves like a fishes real tail would while swimming through the water. If left still the Rose Kuli will float on top of the water. 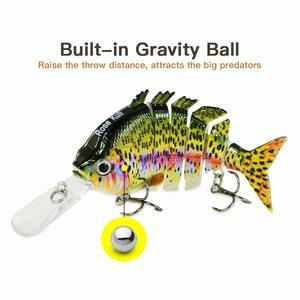 These topwater fishing lures come with a gravity ball which helps the lure to cast farther, and it also helps to make noise to attract the fish. It has two sharp rustproof treble hooks. If one of the hooks doesn’t snag the fish, the other will surely do the trick! You can catch a variety of fish species with this lure like bass, trout, yellow perch, muskie, northern pike and walleye. This lure is also safe to fish in freshwater or saltwater. The Rose Kuli can dive to about 3 to 4 feet. It will float on the water when you are not reeling. Like it’s supposed to and will also dive deep when you are reeling in quickly. And it will stay at the same depth if reeled in slowly. Here are a few techniques you might want to try when using these topwater fishing lures. If you crank it hard enough, it will mimic a dying fish as it will float on its side. Use a 16-lb test line with this swimbait this allows for smooth and long distant casting. Another good tip when fishing with topwater lures is when you see a fish splash get the lure into the area that splashed as soon as possible before the water ripples are done. The fish attacked another bait fish that’s why it splashed, so you want to get that Rose Kuli in the place of the real baitfish that your target fish didn’t catch. Hope these couple of tips help your fishing a little. Using braid line when you’re fishing topwater lures helps you be able to cast your lure farther out into the water. And you will be able to hook the fish better at the end of the cast. You want to be careful not to overdo it tho when hooking a fish because you could rip the lure right out of the fishes mouth. Which defeats the whole purpose of what you are trying to do. I will provide you with a few reasons on why you should purchase this topwater fishing lure. The number one reason is it acts just like a real baitfish in the wild. It also can mimic a dying fish when you are cranking it correctly. It is also safe to fish this lure in fresh or salt bodies of water. Another good reason to purchase this lure is that it comes in a plethora of colors. More color choices mean more opportunities to target different fish species and the various circumstances you will find yourself in. And it is Amazon’s Number 1 Bestseller in the fish plugs category. The price is right at under $10 not bad for a swimbait of this caliber. Please leave questions and comments below. Thank you for reading and Happy Fishing! 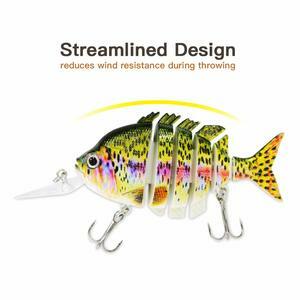 thank for this great reviews on different types of topwater fishing lure. Most importantly as you have provided us with the purchasing link on Amazon. I have also wanted to get a lure lately. All the lures seems to be in the fish shape, are there no other lures that are not in fish shapes? If there are, can you please tell us about it too. The bait your promoting looks awesome and seems very very realistic. I like the multi-body function that allows the bait to move like a real fish. Do you know if they offer a bundle package? Do they deliver out of the USA by any chance? Would you recommend this item for a beginner in fishing? Also, when the fish you are trying to catch hooks on the bait is the bait reusable? If not it would be a good idea to purchase more than one. If it is reusable how long would the bait last before having to replace it? I haven’t seen them for sale in bundles. They do deliver outside of the USA if you purchase through Amazon.com. 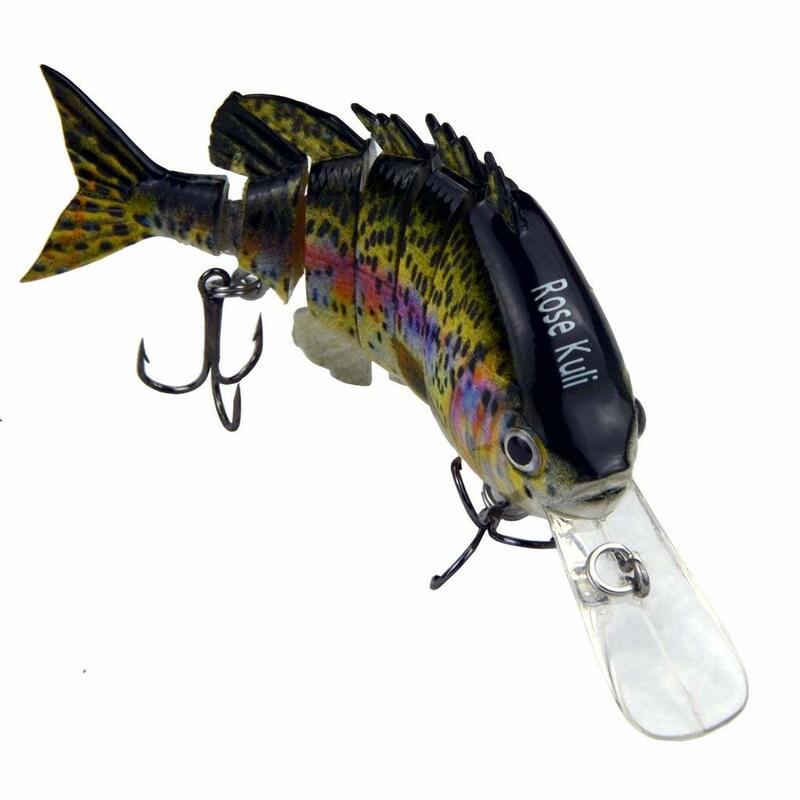 The Rose Kuli would be a good topwater fishing lure for a beginner. It would take some practice casting it and reeling it but once you got the hang of fishing with this lure you will catch some nice bass with it. You can use the Rose Kuli over and over until it gets taken by a fish or disconnected from your line somehow. This lure could last for years. Wow, I have never seen these lures before. I live on the East Coast of Australia where we do a lot of estrurary, beach and ocean fishing. We use soft plastics and lures and i have never seen one like this that is multi-jointed. It does sound like they work the same as the fixed body ones, i.e float, stay at same level when reeled slowly or dive when reeled fast or trawling in a boat. I was un the US recently and bought some fishing gear at a Cabela’s in Fort Worth that whilst was being sold for mainly Bass in lakes there, was suitable for what I do here. Have you tried these lures in an open ocean setting or mainly in lakes etc.? I have used the topwater fishing lures mainly in lakes and rivers in Wisconsin. You would want to opt for a larger type bait for ocean fishing. I also hate when they take the lure and run with it but that’s the nature of the beast. Glad you enjoyed the article. I love the suggested tips. I’m not a big fisher so it’s hugely helpful to see how to get the best use of certain lures. Same goes for what kind of fish it can catch. Makes it easy for a novice like me to know what its best used for and if I can use it on my trip or if it’d make a good gift for some of the more frequent fishers in my friends and family. Yes, this topwater fishing lure would be a great gift for any angler! Hi Cory! I’m impressed on how close to real live bait this lure is. No wonder it’s a Bestseller on Amazon. And that also speaks about its effectiveness. I like the fact that it can be used to catch a variety of fish. I love the multi-jointed feature. This makes it very flexible, and helps the lure’s tail to move like a fish’s real tail. I’m impressed. Thank you very much for this review! You are welcome Henry. The Rose Kuli is in my opinion one of the best topwater lures on the market today especially when you are talking bass fishing.